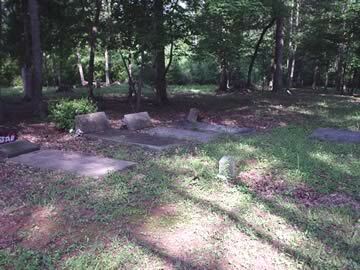 County Line Primitive Baptist Church--back cemetery. From the Baldwin County Courthouse, go west on Hancock Street for 2 blocks or 0.2 mile (or the one large block containing Georgia College & State Univ.). Turn right on Clarke Street. Go one large block or 0.2 mile. Turn left onto Highway No. 22 west (Montgomery St.). Go 2.4 miles. Turn right on Highway 212 west. Go 9.0 miles. Turn right on Neriah Rd to the church. Go 0.2 mile to the church. The cemetery is beside the church. The cemetery was surveyed starting at its corner nearest to the front of the church and proceeded from that corner in a row to the back of the cemetery. The surveying continued in rows going from back to front and front to back, with the last row ending at the back corner of the church. The cemetery was surveyed Aug 12, 2005. Ga Pvt 4457 QM Serv Co.
11 graves - either depressions or marked with fieldstones. Unreadable -- last name has only first letter and last 2 letters remaining. Last name deduced from next grave. 19 depressions or sets of fieldstones. 25 graves in two rows. 11 graves behind set of marked graves. One of the graves is Cleveland Millions, Sr. (see grave 64). Metal tag on cement slab, tag damaged. shares headstone with Emanuel Bryson, Sr.
Is buried among the 11 graves shown as grave 20 in this listing. Handwritten slab down in dirt.